A brilliant Nektan casino, Fruity Vegas looks modern and sleek, with plenty of perks up its sleeve! Check Fruity Vegas casino out! For a zesty mobile gaming experience, look no further than Fruity Vegas. With its cool black background and red lettering, we can already tell that this site means business. This online casino aims to bring user friendliness and games variety to the world of mobile gaming. Whether you’ll be playing on a mobile or tablet, Fruity Vegas looks to ensure that players never have to compromise on quality. For casino and slot games that are available on the go, this site could be your new go-to destination. Have you always wanted to play at a mobile casino that has all the good games and none of the faff? Fruity Vegas mobile casino features over 100 games, but there aren't a dozen types of blackjack or five different cat themed slots – it's all staight to the point and only the very best mobile games are featured. Yet, it's not only that that attracted us to this casino. There is the free £5 that every new player receives upon signing up, a £500 in deposit matches that you can top up your account with and you bet you can use mobile phone billing, namely Boku, to deposit! That wins us right over, so let's investigate how Fruity Vegas mobile casino fared in this review. As a new member at Fruity Vegas, you’ll be given a warm welcome. This is one of the few sites on the web to offer new players a no deposit bonus. You’ll be able to claim £5 of gaming credit, without even depositing any of your own cash. Simply register with the site and attach a valid credit or debit card to access your free funds. Once you’ve completed these steps, your account will be credited with £5 to use on any of the site’s many amazing games. When you begin depositing, the bonus potential rises. On your first three deposits at the site, you could rack up a whopping £500 in bonus credit! Your first deposit will be boosted by 200%, giving you a maximum of £50 in bonuses. On second deposits of up to £200, players will receive a 100% bonus match. Even your third deposit will make some gains. Deposit up to £250 and receive a 50% match. Promotions are not just reserved for new players. Existing players will also get the benefit of some lucrative deals at Fruity Vegas. Earn cashback every Tuesday or hit the Bonus Bank for some extra bonuses. If you find yourself short of cash then claim some of your cash back. If the reels haven’t spun in your favour on a Tuesday, then you’ll receive bonus funds. You don’t even have to claim for the cashback. The money will be credited to your account automatically after the week’s promotional period has ended. The Bonus Bank is open from 6pm until 9pm Monday to Thursday and players could leave up to £50 richer! Deposit during these hours and you’ll receive a 25% bonus booster. In addition to these promotions, the site also has a lucrative VIP scheme to reward its loyal members. As part of the VIP Circle, you’ll become eligible for some exclusive benefits such as priority customer access and up to 15% weekly cashback. You can also look forward to a special birthday bonus and exclusive deposit match offers. As we mentioned earlier, Fruity Vegas is an online casino site that also caters to mobile gamers. As such, you’ll find a large array mobile compatible slot and casino games. Whether you’re looking for a branded slot game such as Psycho or Aliens, or a comedy slot such as Mad Mad Monkey, this site can cater. 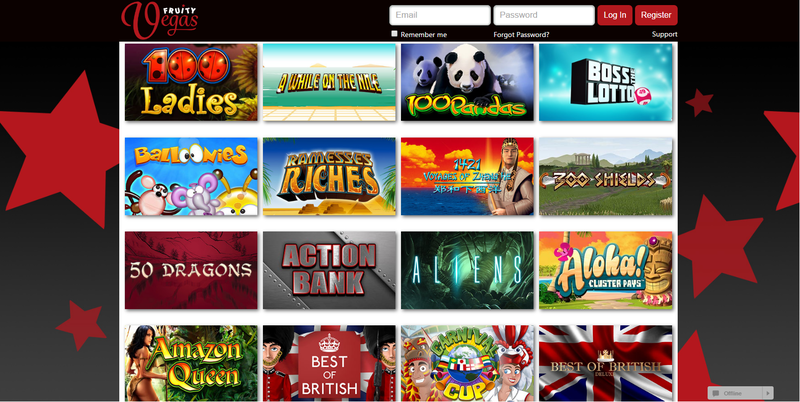 It has slot games encompassing a huge range of genres. There are oriental slots, fantasy, or adventure games to name but a few. If you’re hitting the site to play some casino games then you’ll find different types of blackjack and roulette available. Or for some fast paced fun, why not try one of the site’s scratchies? Merlin’s Millions and Gorilla Go Wild scratch are ready and waiting. All games have even been reviewed by players, giving you an indication of what is popular. When it comes to funding your account, Fruity Vegas gives players plenty of options. Deposit and withdraw using Visa, Visa debit, Maestro, Mastercard or Solo. As this is a site designed with mobile gamers in mind, they’ve also included a payment option to make it easier to fund your account on the go. Boku is a pay by mobile service which allows users to add deposits to their phone bill – super simple and extremely convenient to use. Should you have any queries, the support team is on-hand. They can be contacted by telephone, email or you can even send a letter by post. All contact information can be easily located on the site, under the ‘Contact Us’ tab. The phone lines are open from 9am to midnight Monday to Friday. Many problems can also be resolved by checking the frequently asked questions page on the site. Want to play at Fruity Vegas? Such a great casino, Fruity Vegas is a hidden treasure — seek it out now! Fruity Vegas One in hundreds and thousands of mobile casinos, Fruity Vegas stands out for some things. Notably, their game selection, featuring slots classic and innovative, old and new, niche and super popular will mean that everyone can find that perfect mobile slot for them. 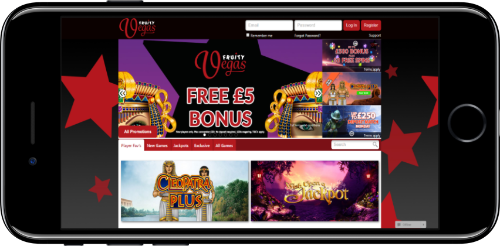 As a slot gamer, you’ll find a tonne of great titles at your fingertips, but Fruity Vegas doesn't limit itself to that. There are arcade games, scratchcards and casino games too - plenty to look around with that free £5 bonus that you get. And when you're ready to spend some money to keep on playing, you can deposit by mobile phone billing - two thumbs up, Fruity Vegas! PreviousBoku VS Zimpler — Which Is The Best Mobile Depositing Method?